It's January 1, 2019! Wow! Hard to believe another year is over. I'm always excited about the New Year and often spend my day sorting papers, cleaning up and getting ready for the year to come. That will be no different today, except I will be spending it getting ready for my Stampin' Up! year to come - planning new classes, blog posts and of course cleaning up my crafting space! 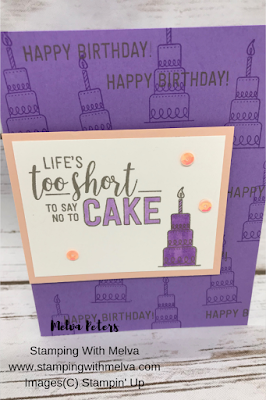 Today I'm sharing a card that features the Amazing Life stampset for the new Occasions Catalogue. I love how easy it was to make this card. I stamped the Highland Heather Cardstock with random images in Highland Heather and Gray Granite to make the background. Cut Highland Heather cardstock 8 1/2" x 5 1/2" and score in half to make card base. Randomly stamp cake image in Highland Heather - I didn't worry if the images were straight! On piece of Whisper White cardstock (3 1/4" x 2 1/2") stamp the sentiment and cake in Gray Granite. Colour the "CAKE" words with the Light Highland Heather Stampin' Blends. 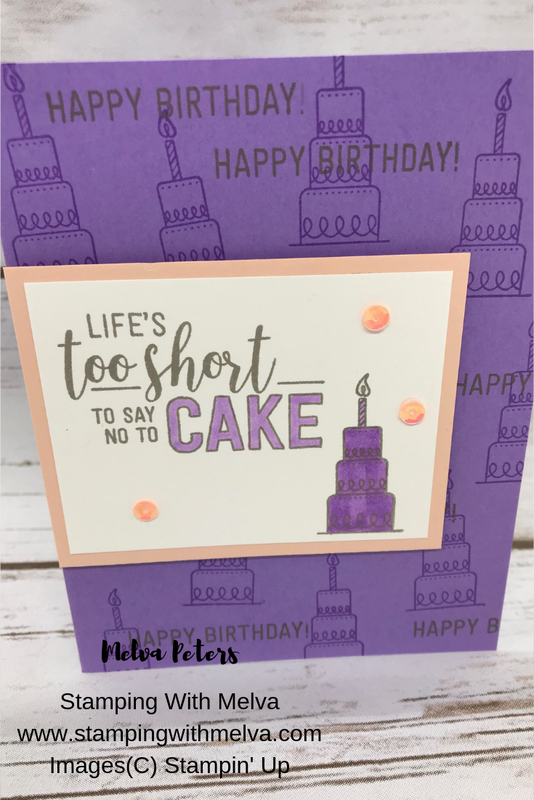 Colour the cake with the Dark Highland Heather Stampin' Blends. Adhere the Whisper White piece to a Petal Pink piece of cardstock (3 1/2" x 2 3/4") using Snail. Add Gingham Gala Adhesive-backed Sequins to finish the card. All of the new products I used for this card will be available starting January 3rd. Check out the supply list below. Reserve now by emailing me at stampinwithmelva@gmail.com. I will be placing the order on January 3rd, so email me as soon as possible to be included in the paper share.